When the cold and flu season hits, it affects some people harder than others. It’s just another reason why getting your flu shot is so important during this time of year. 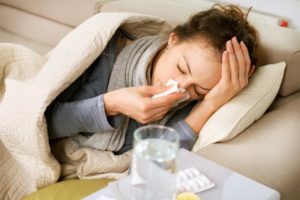 However, if you have the flu and are currently taking over-the-counter medications or drinking beverages that aid your sickness, you may want to reconsider. Many of these aids may help your symptoms, but they can also increase your risk of plaque buildup and tooth decay. To combat them, take note of these flu season tips. Decongestants can make a big difference in your runny nose, but at a price. While decongestants make it easier to breathe, they can also dry your mouth out more than you’d prefer. As a result, your teeth and gums are at higher risk of attacks from plaque-causing bacteria. The drier your mouth is, the higher your risk is for decay. To combat this increased dry mouth risk, it is imperative that you stay hydrated. You should be doing both while taking the decongestant and for as long as you are sick. Water keeps your body’s immune system working. Keep in mind that decongestant use should only be temporary. Read the instructions on the box and visit a doctor if you need to use the product any longer than what’s recommended. Cough drops soothe the throat when all you can do is cough in bed all day. While their soothing properties may be effective, the way they’re administered should be considered. Cough drops stay in the mouth for long periods of time, and most cough drops are high in sugar content. While some ingredients are intended to have medical benefits, others are only meant to make them taste good. That is the sugar, and it can be devastating for your oral health. Liquid cold medicine can have the very same detriment. Reduce your sugar intake by opting for sugar-free cough drops. If you do eat sugary cough drops, brush your teeth afterwards. Choose gel-caps or pills as this will remove much of the issues associated with liquid cold medicine. If you must drink it, do so before a meal to ensure saliva production is high afterwards. Brush your teeth after the meal as well. Orange juice and hot tea both have their own unique benefits for the common cold and flu. Orange juice contains vitamin C, which is crucial for your immune system. Hot tea can soothe your throat, reduce nausea and relieve aches and pains. However, orange juice softens enamel and hot tea can still be corrosive, especially if it’s black tea or containing sugar and honey. When drinking tea, always avoid adding more sugar or honey, especially if there are already sweeteners present. Brush after drinking it to prevent staining and plaque development. Only drink orange juice during mealtime and not throughout the day. Sip water throughout the day and choose an orange juice that’s been fortified with calcium, which is good for strengthening enamel. You can protect your teeth this flu season. To learn more or ensure your teeth haven’t been damaged during your cold and flu regimen, schedule an appointment today! Dr. Nelson Y. Howard earned his dental degree from the UCLA School of Dentistry. He’s completed thousands of hours of continuing education since then and shows no signs of slowing down now. His goal is to make sure his patients are fully informed this holiday season when it comes to their oral health. To learn more, you can contact him through his website.